Cool take on mythic lycanthropy! So, this is a bit odd – I have to acknowledge something – I LOATHE how PFRPG handles Lycanthropy. In my home-game, I have by now more than 30 strains of lycanthropy, with different degrees of power and unique abilities. Just thinking about the default one-size-fits-all table makes me hurl. I’m not particularly well-suited for this review, but I’ll try my best to abstract my bias. So, what is mythic lycanthropy about? Well, essentially, these guys lose all benefits of their tiers, instead gaining this template – which provides essentially a tier-substitution based on the base CR of the creature. A handy table on the SRD-page sums that up at one glance for convenience’s sake – neat! Mythic lycanthropes receive the bloodrage universal monster ability, can talk to animals and benefit from a greatly enhanced sense of smell and at higher levels, receive barbarian rage powers, can call forth mythic creatures and also benefits from scaling fortification and regeneration. Communicating through animals called or summoned, transforming hapless victims into animals under the control of the lycanthrope, much more infectious and potent lycanthropy – all pretty nice. At the highest levels, the lycanthrope may utilize quarry via mythic power and greatly enhance the capacities of those hunting with it – nasty! 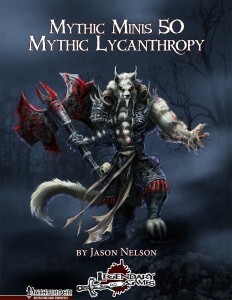 Jason Nelson’s take on mythic lycanthropy is glorious – while it does not tackle the bloodline issue, that is a preference and the quasi-path design-decision is pretty cool…though I maintain, the material may have warranted a full-blown mythic path. Still, even for scavenging purposes only, this is an inspired little pdf. Hence, my final verdict will clock in at 5 stars. This is a second or third time you mentioned your variant lycanthropy. Is there any chance you’ll publish it? Yes, there is a chance, but as of right now, no active plan to do so.